Door County, Wisconsin has been home to countless first dates, second dates, engagements, weddings, honeymoons, anniversaries, and vow-renewals. Bringing couples together in the beauty of our natural scenery and offering relaxation and romance. Whether the peninsula is a romantic return for you and your darling, or a new experience to enjoy together, there are lots of great lodging specials available to make your visit together exceptional. Find a Dinner by Candlelight or just a cozy spot to gaze into your darling’s eyes over a drink with the Door County Chefs FREE Mobile Dining App! The Ashbrooke is an adult vacation resort hotel – get away from it all! Located in the heart of Egg Harbor, you’ll find yourselves just minutes from fabulous shopping, delicious food, and lots of activities and entertainment. Book your Date Night at The Ashbrooke and get romantic! Beachfront Inn, located on the water in Baileys Harbor offers warm hospitality while providing guests a place to relax, enjoy the ambiance, and make new memories. Rooms are available. 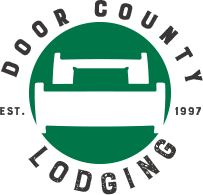 Romantic Getaway Package: You’ve been looking forward to a romantic getaway for two in beautiful Door County, but why waste your weekend running errands? Let the helpful staff of the Birchwood Lodge handle the details for you, so you can spend more time with that special someone! Our discrete, professional staff can even help you surprise your significant other. When you enter your suite, which includes a king sized bed, double Jacuzzi whirlpool, and a gas fireplace, we will have a beautiful hand-picked flower bouquet and melt-in-your-mouth chocolate truffles and scented bath salts waiting for you. We’ll make your reservation at elegant Alexander’s Restaurant, and gift certificate for $40.00 toward dinner is included. Package price is $80 plus tax added to the room rate. Wine & Dine Package: This is the perfect package for wine lovers! Spend an afternoon on a guided wine tour for two at Door Peninsula Winery. See the old school building and listen to the success story of the winery. Select the wine you like with a $20 Winery Gift Certificate. Be a guest to a romantic evening of dining at the new Alexander’s Restaurant ($70 Gift Certificate). Snack on goodies provided in your Cheese and Cracker basket, then toast with your winery tour selected wine in your room after a busy day. Package price is $115 plus tax to the room rate. Magic Delights Package: Stay two nights in a Premier Suite, Grand Suite or Premier Deluxe Suite with double Jacuzzi whirlpool, gas fireplace and king size bed. Whether you are an early riser or prefer to sleep in, enjoy the delights of breakfast at Al Johnson’s Swedish Restaurant ($20 Gift Certificate). Spend part of the afternoon taking a scenic tour of Door County on a horse drawn carriage ride (Advanced reservation required). To relax after a fun day of walking in the parks or shopping, wind down in front of your fireplace with a delectable assortment of tantalizing fondue delights. Package value $244 – $442 plus tax (depending on the type of the room and the season). Round Cake (+$16): White, chocolate or marble cake with butter cream or powdered sugar (sweeter) frosting. Cake decorated with your choice of wording. Bottle of House Wine (+$14): Choice of Chardonnay, White Zinfandel, Moscato or Merlot. Mixed Flower Bouquet (+$30): Seasonal arrangement of mixed flowers. Nature of Romance Package: We’ll have a warm room waiting with a gift basket of local cheeses, crackers, meats and a bottle of cherry wine. Settle in and get cozy while watching a DVD from our movie library. Let us make arrangements for a private sleigh ride (weather permitting) or scenic Door County Trolley Tour and reservations for dinner for two ($40 value) at one of two fabulous restaurants: The Chop Steakhouse, or The English Inn of Fish Creek. We’ll also include a $25 Door County gift certificate. Rates from $249-$489/ for 1 and 2 night packages depending on room selection. * Country House Resort in Sister Bay offers a quiet, relaxed, adult atmosphere and a perfect place to get away from it all. 46 rooms & suites, most with private, water view balconies, are nestled on 27 secluded, wooded acres on a rolling bluff overlooking the waters of Sister Bay. Book this package and get ready for romance! Get Away To Romance Package (Valid thru May 2, 2019): Two Night stay for two in a water-view room or suite with Choice of a two person massage package at The Spa At Sacred Grounds OR a Door County gift basket; a $25 Door County Gift Certificate; and either a Candlelight Dinner for 2 at the White Gull Inn OR Dinner at Alexander’s Restaurant (retail value of $50). Packages begin at $400 and vary with room selection. Cannot be combined with any other specials or promotions. * The Spa at Sacred Grounds is open limited days and hours during our Quiet Season. If they are not open or available during your stay, comparable services may be provided by another spa or massage therapist. Vow Renewal Package (Valid thru May 15, 2019): We provide a seasonal bride’s bouquet & groom’s boutonniere, wedding cake for two with dedicated ceremony space and a justice to officiate your ceremony. Luxuriate for two nights in your elegant whirlpool, two way fireplace suite welcomed with a bottle of champagne! Draw your herbal 6’ whirlpool with robes, grains & loofah. Spend your first married days together with treatments at the spa followed by a romantic dinner with included gift certificates. Launch your Wish Lantern over the water anticipating your future together! We’re happy to personalize your honeymoon with a carriage ride, limo service to tour the county, private dinners, or whatever strikes your fancy! 2 Night Minimum Stay. Limit 10 people for ceremony. Crazy Little Thing Called Love (Valid thru April 29, 2019 *excluding holiday periods): Wine and roses await your arrival! Whether it’s you and your honey, 2 couples, or your entire family, all sweethearts will enjoy the fabulous accommodations and the included $40 dinner certificate to Donny’s Glidden Lodge Restaurant, voted by the readers of Door County Magazine as having the best setting in all of Door County! Romance Package: Available for a two night stay in our cozy one or two bedroom suites. Upon arrival to your room, you will receive a basket of homemade Door County bath salts, soaps, and wonderful massage oils. Enjoy a romantic dinner for two with your $50 gift certificate to the English Inn. When you come back to your suite, light your Door County candle and open your bottle of Door County Romance Wine, which will be waiting for you in your suite. Then you and your loved one can enjoy a complimentary movie of your choice. Please call for availability and pricing! * Open Hearth Lodge in Sister Bay is located on 6.5 acres of scenic Door County open space with landscaped lawn, rural meadows and young forest. Offering King Whirlpool rooms,Premium King Rooms, Lodge Rooms, Deluxe 2 Queens, One-Bedroom Suites, and more. Book a package to enhance your stay! Hearts Ablaze Romance Package (Valid thru April 2019) Package Includes: 2 Nights in a Lodge Room; $50 Dining certificate to the Chop, LURE, or Pasta Vino; Wine gift basket (specialty hot chocolate can be substituted for the wine); Door County Chocolate Bar by DC Chocolate Design; Use of DVD player with a movie and popcorn. Price: Weekends $260 for 2 adults, Monday-Thursday $230 for 2 people. Upgrade to a Premium or Whirlpool Room for $30 more. Mention this at time of booking. Romantic Getaway Package: For those looking for a romantic getaway for two in beautiful Door County, in addition to the items listed below, we will also give you the opportunity to sleep in by extending your check out time by an additional two (2) hours. Package includes: A gift basket of a bottle of wine or sparkling cider, two wine glasses and a box of chocolates; a bouquet of flowers; $40 coupon to Chop, Lure, Alexander’s Restaurant or The English Inn. You can also add on for an additional cost, the following items and we will make the reservations for you: a 60 minute couples’ massage at Spa Verde; Tickets to a performance at Peninsula Player’s Theatre. Use our FREE Email Concierge Service to inquire about your specific dates and lodging needs!